No racing today at the Danske Bank 1720 Irish Nationals. Lift outs underway and BBQ this evening. Full results are available on the link below or alternatively here. Irish National Champions 2018 – “Da Fishy” – (left to right) Rob O’Leary, Cliodhna Connolly, Donagh Good, Peter O’Leary and Youen Jacob. Final standings after 5 races were as follows:- 1st “Da Fishy” – Donagh Good (RCYC), 2nd “Antix” – Anthony O’Leary (RCYC/BSC) and 3rd “Rope Dock Atara” – Robbie English and Ross McDonald (RCYC/HYC). 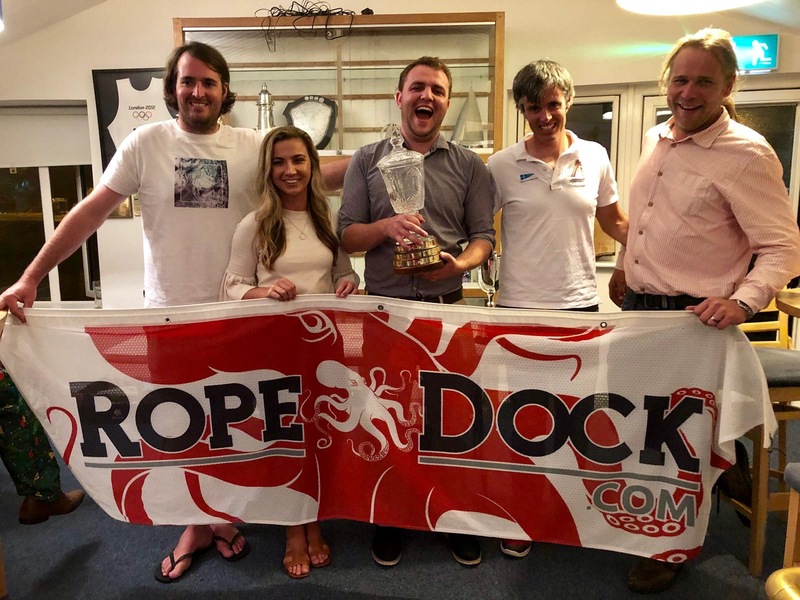 Thank you to our sponsors – Danske Bank and Rope Dock, competitors, supporters, race management team of Richard Leonard, Colette O’Flynn and Ciaran McSweeney and helpers that made this event such a success.